Oh, The Horror: A New Mom Takes The Weekend Off : The Baby Project Loriani Eckerle says she felt judged when she left her baby with her husband for the weekend. People just couldn't understand how she could "leave" her daughter. Matt, Loriani and Valentina Eckerle spend some time on the beach. Both mom and dad are pitching in equally, six weeks after their baby was born. OK, ready? I'm about to shock you. About three weeks ago, when my daughter was a mere 6 weeks old, I left her with her dad for the weekend. One of my oldest friends was getting married in Boston, and I had miles to use. My husband encouraged me to go. Not only did he encourage me to go, but he was almost excited about it since he rarely gets to spend a whole day alone with Valentina. So he didn't have a problem with it — but almost everyone else did. People just couldn't understand how I could "leave" my daughter. I admit, my own insecurities as a mother probably exaggerated people's reactions in my head. I felt judged. One woman asked, looking confused, "So your husband is feeding your baby?" To which I wanted to reply, with a surprised look: "You have to feed them?" I didn't leave my daughter with a nanny or even a friend. I left her with her father, a fact that seemed to carry no weight. Do you think anyone would have said anything to Matt had he left me alone with Valentina instead? 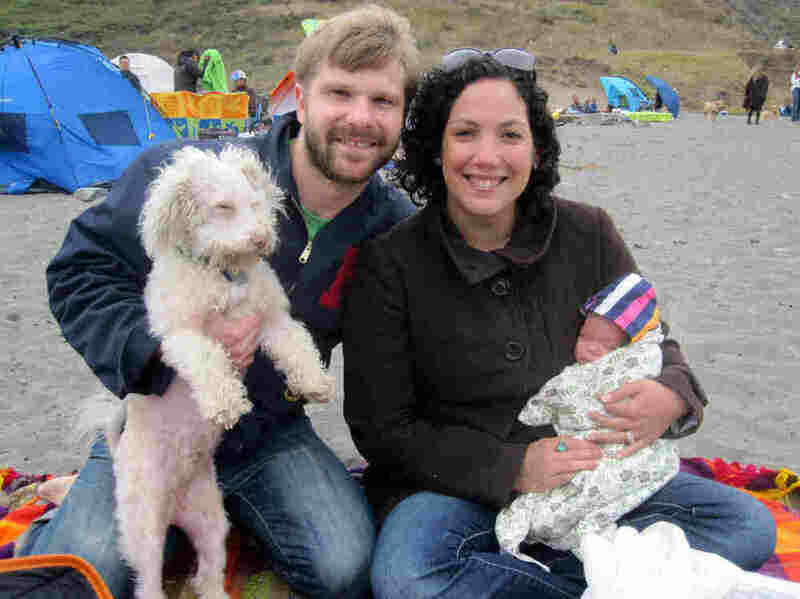 Loriani Eckerle, 31, from Oakland, Calif., is a first-time mom with her husband, Matt. Their daughter was initially diagnosed with Mosaic Trisomy 16, but was born healthy after a dramatic delivery. I was reminded of all this the other day at my new mothers group. One mother made the observation that her husband would be showered with compliments of what a good father he was by doing miniscule things such as carrying his daughter for 10 minutes or changing a diaper. Yet she herself rarely got such compliments, despite the fact she was spending all day with the baby. What a very sad realization to have as a mother that we are not only judged harsher as parents, but also unlikely to ever hear the praise we deserve. And boy, do we need to hear it. Just the other day at Target, a woman started chatting with me at the checkout line. She asked how old Valentina was and commented that her 9-month-old was still keeping her up at night. I innocently asked whether they were supposed to sleep through the night at that age. A dark cloud came over this woman's face as she commented that all her friends' babies were sleeping through the night, and that she was obviously doing something wrong. I found myself comforting a perfect stranger and assuring her she was a great mom. Valentina Eckerle shows off her happy baby face. Or look at how competitive we all get around each other. Attend a gathering of mothers, and you're likely to be surprised at how often we're sizing each other up. One simple remark can drive us crazy for weeks. How can Kathy's son be sitting up already? Sally's daughter is crawling! Jen's twins are speaking Latin!! Enough already. 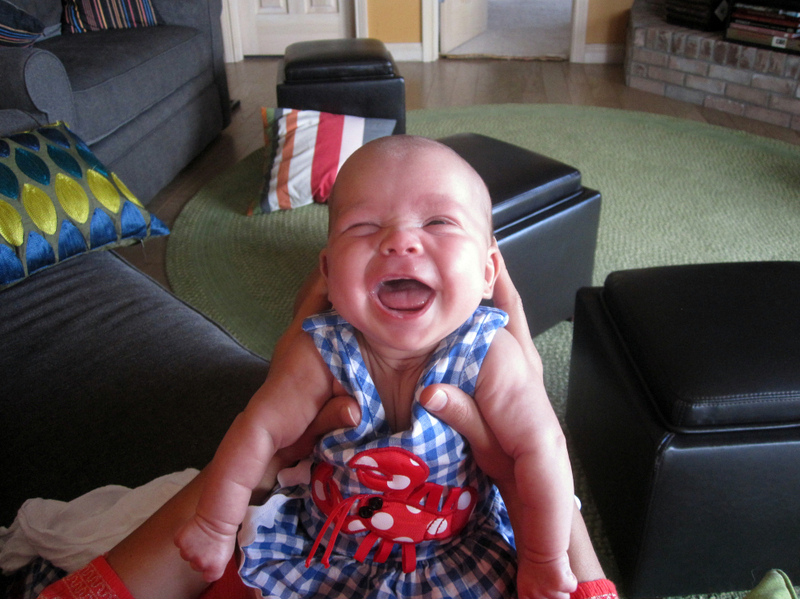 Valentina is a happy baby. She's more than twice her birth weight. More importantly, I haven't dropped her. So yes, I left her for a weekend. But I refuse to think this makes me any less of a mother than Carol Brady. I'll even go as far as telling myself "I'm a good mom," because I clearly can't count on others to tell me so. It is up to us to pat each other on the back, because only we know just how hard and thankless the job can be. And so for this, my final blog post, I would like to tell all you mom readers (and OK, the dads, too), you're doing a great job. May we ALL enjoy the ride and take the occasional weekend off.